STS-131 Mission Specialist Rick Mastracchio exits the Quest airlock on the International Space Station on April 9, 2010 to begin the first of three spacewalks. Thisstory was updated at 10:52 a.m. ET. Twoastronauts floated outside the International Space Station early Friday tobegin the tricky task of replacing a large, old ammonia tank on the orbitinglaboratory?s hull. Discoveryshuttle astronauts Rick Mastracchio and Clayton Anderson had to use a prybar to pull the new ammonia tank off its mooring in Discovery?s payload bayafter it got stuck. But after that, its move to a temporary storage point onthe station went smoothly. ?Clay,you did a great job holding that tank steady," the astronauts said. 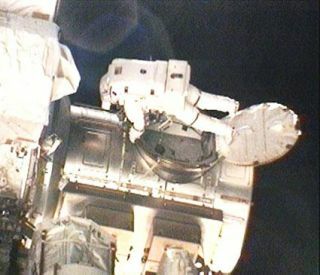 Thespacewalkers spent 6 1/2 hours working outside the station to disconnect anempty ammonia tank on the station and prepare its replacement for installationon a later spacewalk. It was the first of three spacewalks planned for theirmission. ?Greatjob,? Mastracchio said of the orbital work. The1,700-pound (771-kg) ammonia tanks are large boxy units filed with toxiccoolant for the space station?s thermal control system. The old tank thespacewalkers are replacing is empty, and will be returned to Earth on Discoveryto be refurbished and refilled. Andersonis especially qualified to man-handle the space station?s ammonia tanks. Afterall, he tossed a different one off the station in 2007 to discard it while on asix-month mission on the orbiting laboratory. The tank stayed in orbit as spacejunk for more than a year before burningup in Earth?s atmosphere. Mastracchioand Anderson also retrieved a Japanese experiment from the station?s hull andreplaced a faulty rate gyroscope sensor. Theyhad planned to work on the space station?s old port-side solar array batteries afterthe ammonia tank work, but Mission Control scrapped that chore due to thepossibility of a shock risk to the spacewalkers. NASA learned of shock hazardjust before Discovery?s flight, mission managers said. Itcrops up only when astronauts are working at the very edges of the station,where its outer solar wings are, and when the station is flying over highlatitudes of the Earth. At least two spacewalkers worked on the port solararrays last year before NASA learned of the shock risk, mission managers said. ?Therisk was still out there at that time, but the particular environment may nothave been present at that time,? lead station flight director Ron Spencer toldreporters of the earlier spacewalk. Future spacewalkers will havebetter-insulated tool kits to avoid the risk, he added. Soinstead of battery work, Mastracchio and Anderson tackled some unplanned choresto work on cables and clamps. ?Here?swhere our EVA goes different,? said astronaut Dorothy ?Dottie?Metcalf-Lindenburger ? a former teacher - using NASA?s term for spacewalks asshe choreographed the work from inside Discovery. ?So we just wanted to say,?Slow down.?? Butthe work went swiftly, with the astronauts accomplishing all of their chores.It was the fourth spacewalk for both Mastracchio and Anderson. Mastracchiosaid the space station is much larger since his last trip to the outpost in2007. It took a lot more work to move around, simply because there was a lotmore space station. ?It?slike a marathon with your arms,? Metcalf-Lindenburger said. Theastronauts plan to venture back outside the station on their second spacewalkon Sunday. Metcalf-Lindenburger, NASA?s last educator-astronaut expected to flyon a shuttle, will oversee that spacewalk as well. ?She?sa former teacher, so we have to do whatever she says,? Anderson joked withMission Control after the spacewalk. ?Otherwise she?ll rap our hands with aruler.? Whilethe spacewalkers worked outside, it was also a busy day inside the spacestation as well. Therest of the 13 astronauts aboard the linked shuttle and station worked togather to start unloading huge racks of equipment ? each the size of adouble-wide refrigerator ? from inside the Leonardo Multi-Purpose LogisticsModule (MPLM), a cargo pod delivered to the station on Thursday. ?Outside the station, the first spacewalk isgoing on. Inside the station, we moved four racks from MPLM to ISS. Big movingday!? station astronaut Soichi Noguchi, who represents Japan, wrote on hisTwitter page, where he?s been chronicling his mission as Astro_Soichi. Discoverylaunched into orbit Monday and is due to stay docked at the space stationuntil next Friday after completing three spacewalks at the orbiting lab. But the shuttle astronauts will likely get an extra day at the stationdue to an antenna failure on Discovery that has forced the crew to rely on thespace station to beam large data files back to Earth. The extra day would be used to inspect partsof Discovery?s heat shield late in the mission, a standard check, and send thevideo and images to Earth for analysis to make sure the shuttle is safe tore-enter Earth?s atmosphere. It would extend Discovery?sspace mission to a 14-day flight. Mission Control radioed the shuttleastronauts late Thursday night to inform them that no extra focused inspectionof Discovery?s heat shield will be required while they?re docked at the space station. Discovery?s mission is one of NASA?s last fewshuttle missions before the space agency retires its aging three-orbiter fleetin the fall. After this flight, only three more shuttle flights remain.